Pinwheels crafted by about 650 students at Apollo Beach Elementary School make up this large pinwheel signifying the children’s commitment to love, tolerance and peace in the world. Luke Haverfield, a second-grader at Apollo Beach Elementary School, sticks the pencil end of his pinwheels into the ground while his classmates wait their turn. Apollo Beach Elementary was the site of a peaceful demonstration Sept. 21 as about 650 children marched out of their classrooms onto the school’s front lawn. Students in grades K through 5 planted brightly colored pinwheels they’d made in school to form the shape of a giant peace sign in the grass. 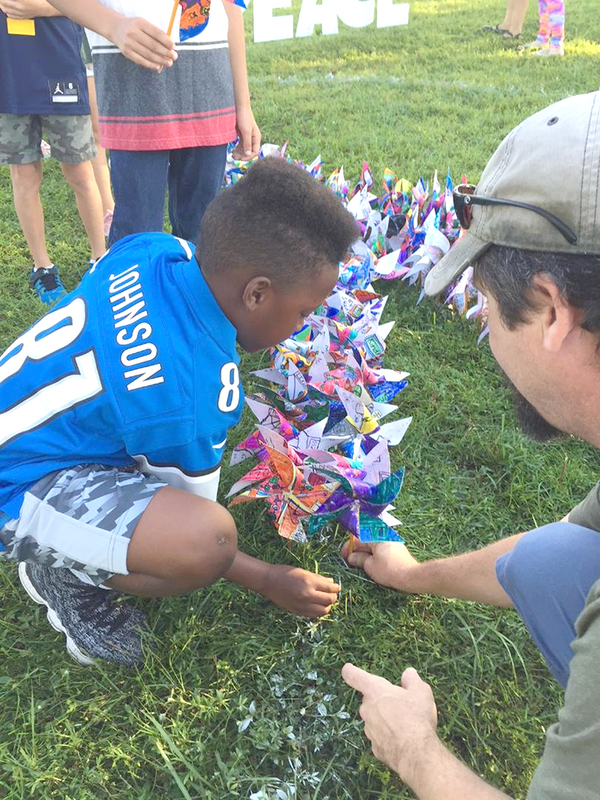 Symbolically held on the annual International Day of Peace, the planting showcased the end of an annual four-week art project called Pinwheels for Peace, which has been taught at the school by art teacher Margit Redlawsk for the past 11 years. 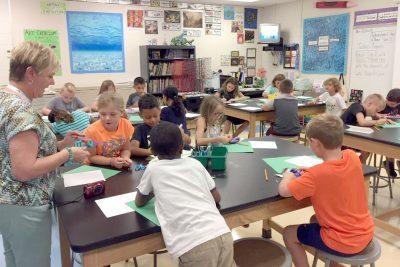 Apollo Beach Elementary is recognized as a National School of Character, and this project reflects the school’s mission of teaching children to become both good students and good people. Redlawsk is a member of that staff. Redlawsk noted she continues to guide this project each year for those reasons. 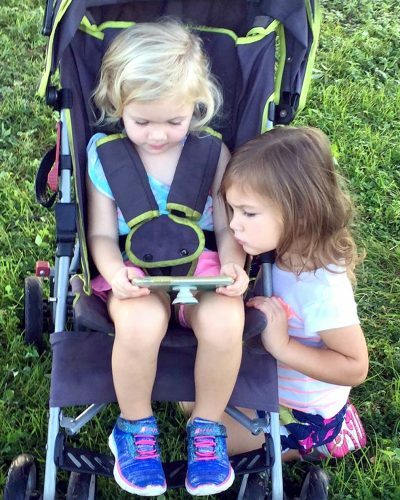 “If we want a peaceful world, we need to start with our young people,” she said. 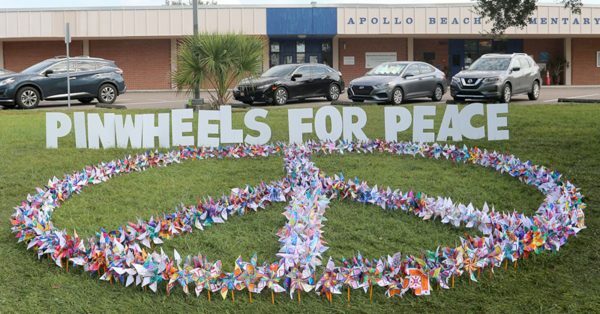 Second-grade student Parker Houston plants his pinwheel in the grass to make a giant peace sign Sept. 21 as part of Apollo Beach Elementary’s annual Pinwheels for Peace project. During Pinwheels for Peace, students spend their weekly art classes learning principles of design, including the use of radial symmetry, lines and shapes, balance and color. They also talk about how love, cooperation, harmony, tolerance, respect and acceptance are essential elements of peace. 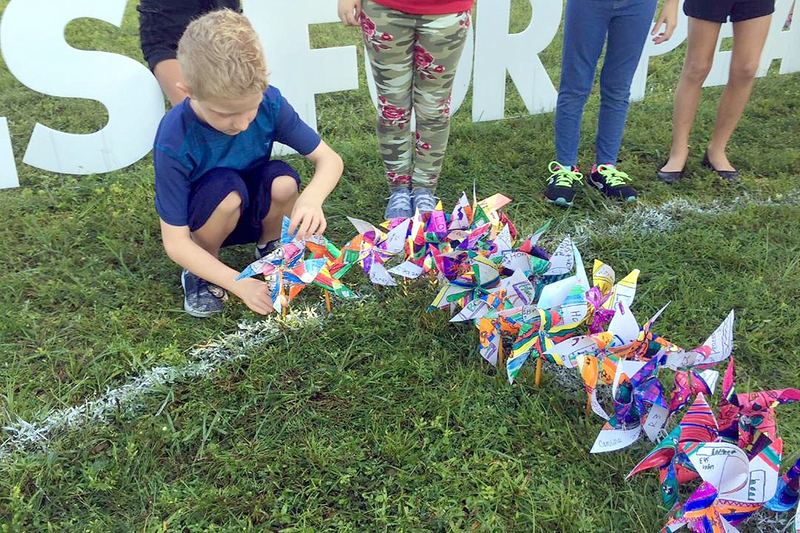 To fashion their pinwheels, the children color preprinted designs on one side of small paper squares and then write words describing their feelings about peace on the opposite side. The squares are partially cut, folded into pinwheels, and then fastened to the eraser end of a pencil with a tack. The Pinwheels for Peace project was started in 2005 by art teachers Ann Ayers and Ellen McMillan, of Monarch High School in Coconut Creek. It’s a nonpolitical, visual statement of peace made each year on the International Day of Peace, Sept. 21. Millions of pinwheels are displayed on this day in countries around the globe. The International Day of Peace was established in 1981 through a unanimous resolution of the United Nations. Its aim is to promote and strengthen the principles of peace among nations and individuals throughout the world. 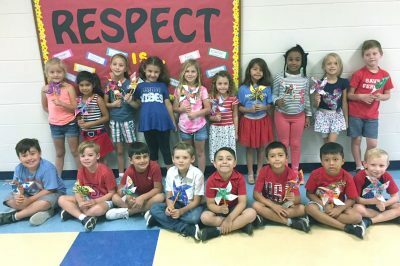 Students in Stacy Graves’ first-grade class are all smiles as they show off their pinwheels before heading outdoors to plant them in the school’s front yard. 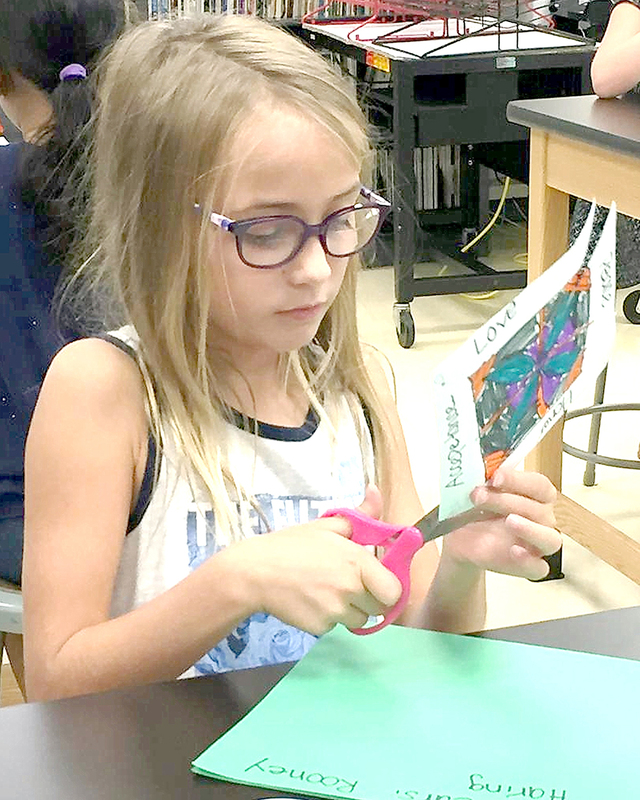 Eight-year-old Caroline Licursi carefully cuts her pinwheel-in-the-making during Margit Redlawsk’s weekly art class. 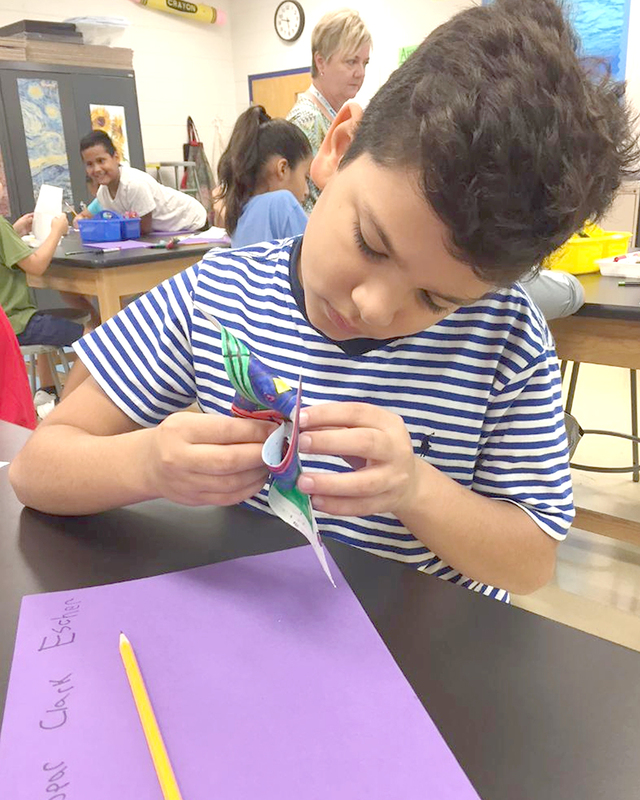 Manny Gaspar, a fourth-grade student at Apollo Beach Elementary School, fashions a pinwheel out of a small paper square he colored and decorated with words of peace during week three of the school’s Pinwheels for Peace art project. 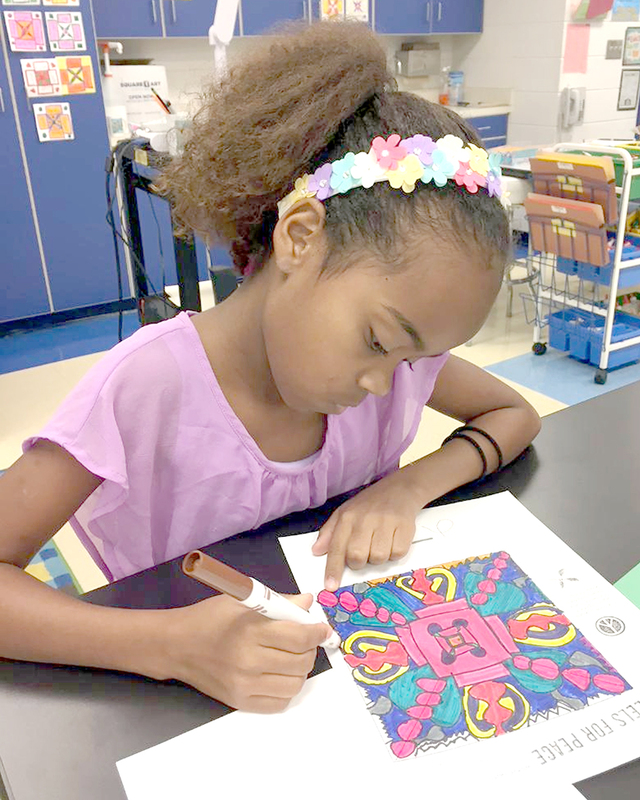 Apollo Beach Elementary School third-grader Kalena Bywaters uses a colored marker to fill in a preprinted design that became one side of her pinwheel during this year’s Pinwheels for Peace art project. Art teacher Margit Redlawsk walks around her classroom offering one-on-one instruction to those students needing help with construction of their pinwheels. Future “pinwheelers” Emma Page, 2, left, and Melina Fenton, 3, are more fascinated by the game they’re playing than in the pinwheel planting by their siblings at Apollo Beach Elementary School. 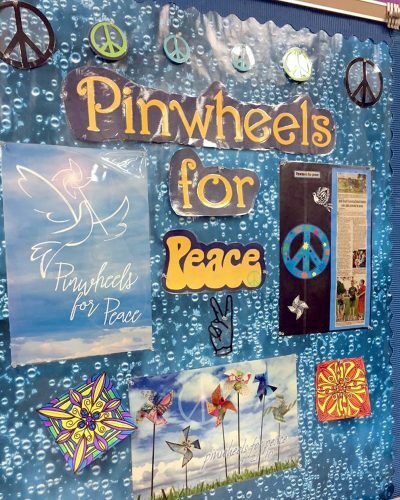 This colorful poster hangs in teacher Margit Redlawsk’s classroom during the four-week Pinwheels for Peace art project.